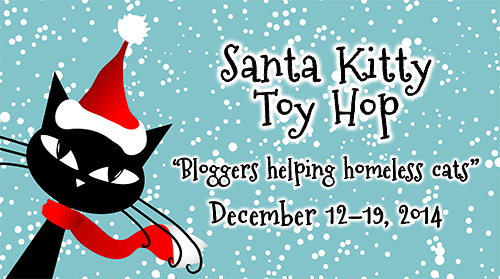 From December 12-19, bloggers are going to gather up donations for a rescue. And then blog about it and link to Summer's blog. What fun...and a great way to give back. Some are doing local rescues, some are doing rescues they know and love. Whatever works for you. There will be something else going on that day, and we will tell you about it next week. Mom will be out on Sunday at an adoption event too.... busy weekend. We hope you are staying warm (or cool depending on where you live) and safe this weekend. Take care - and take a good long nap. And here is our e-card for Christmas made by the wonderful Ann of Zoolatry (we are sending others too but love this one). I like the e-card. I hope those gift-tags get put on a lot of gifts. The e-card is great! Good luck to your mom (and all the volunteers) this weekend. 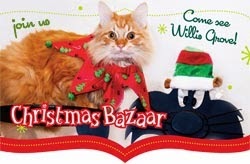 I'm glad you are spending the holidays helping rescue pets! I can't think of anything better! Rescue and adopt is the best ever! Love your eCard!!! guys...way kewl shout outs two day N yur card iz AWESUM !!!!! We hope all goes well at the adoption event. We love the e-card! Sounds like some fun stuff going on! And I look forward to finding out what else is going on besides the Santa pics! Suspense!